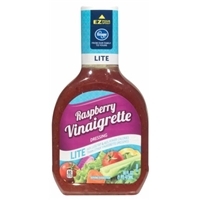 Enhanced with up to 15% of a solution for flavor & juiciness of soybean oil, water, white vinegar, red wine vinegar, salt, sugar, cider vinegar. 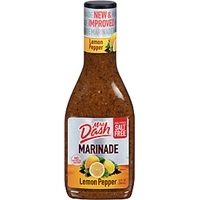 Contains 2% or less of: dijon mustard (vinegar, mustard seed, salt, water, white wine, spices), dried garlic, garlic, concentrated lemon juice, spices, natural flavor, xanthan gum, molasses, corn syrup, caramel color, tamarind with potassium sorbate and sodium benzoate to preserve flavor. 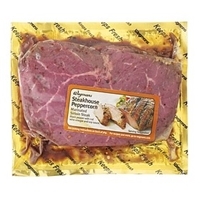 Steakhouse peppercorn marinade: enhanced with up to 15% of a solution for flavor & juiciness of water, red wine vinegar, salt, sugar, spices, dried garlic, contains 2% or less of the following: soybean oil, concentrated lemon juice, dried onion, hydrolyzed soya and canola protein, white vinegar, xanthan g um, molasses, dried corn syrup, caramel color, corn starch, ammonium chloride, natural flavor, tamarind, with sodium benzoate (preservative). 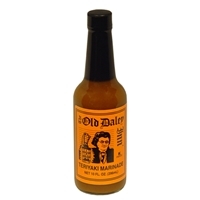 Water, distilled vinegar, onion juice (onion juice, vinegar), spice blend (dried onion, spices, dried carrot, dried garlic, orange peel, chili pepper flakes, corn syrup solids, lemon peel, dried red bell pepper, lemon juice, turmeric (color), citric acid, maltodextrin, sugar, natural flavor, lemon oil, red pepper, spice extractives, soy lecithin), sugar, modified corn starch, lemon juice concentrate, dried garlic, natural flavor, citric acid, xanthan gum, potassium sorbate and potassium benzoate (to preserve freshness), modified cellulose gum, turmeric extractive. Water, distilled vinegar, sugar, modified corn starch, molasses, tamarind extract, natural hickory smoke flavor, natural flavor, caramel color, garlic powder, dried garlic, onion powder, mustard flour, potassium sorbate and potassium benzoate (to preserve freshness), xanthan gum, polysorbate 60, dried onion, black pepper, allspice, dried red bell pepper, cloves, thyme, parsley, calcium disodium edta (as a preservative). 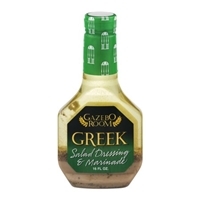 GAZEBO ROOM GREEK SALAD DRESSING & MARINADE.GREEK IS AN ALL NATURAL FAMILY RECIPE WITH NO PRESERVATIVES OR ARTIFICIAL INGREDIENTS FOR OVER 50 YEARS. 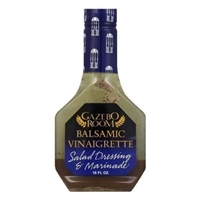 Brand/Manufacturer: Gazebo Room Best Dressed Associates, Inc.
Oil (soybean and olive), cider vinegar, salt, monosodium glutamate, natural flavoring, spices. Gluten free. 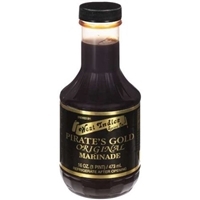 Oil (soybean and olive), balsamic vinegar, cider, vinegar, salt, monosodium glutamate, natural flavoring, spices. Gluten free. 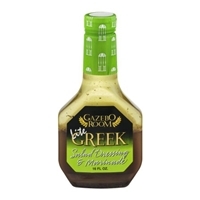 Oil (soybean and olive), water, cider vinegar, lemon juice, salt, monosodium glutamate, natural flavoring, spices. Gluten free. 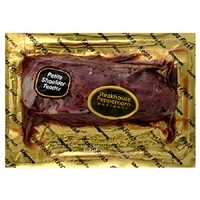 Enhanced with up to 15% of a solution for flavor & juiciness of water, red wine vinegar, salt, sugar, spices, dried garlic. Contains 2% or less of: soybean oil, concentrated lemon juice, dried onion, hydrolyzed soya and canola protein, white vinegar, xanthan gum, molasses, dried corn syrup, caramel color, corn starch, ammonium chloride, natural flavor, tamarind, with sodium benzoate (preservative). Distilled vinegar, papaya puree, pineapple concentrate, water, sugar, soy sauce concentrate (water, soybeans, wheat, salt and sodium benzoate as a preservative), spices, salt, tomato paste, dried garlic, apple concentrate, soybean oil, molasses, foods starch-modified, monosodium glutamate, caramel coloring, xanthan gum, and sodium benzoate (preservative). 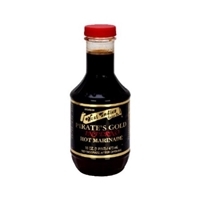 Soy sauce (water, wheat, soy bean, salt), water, granulated garlic, chili powder (chili pepper, cumin, oregano, garlic), pineapple juice from concentrate, citric acid, lime juice, ribotide, and less than 0.10% sodium benzoate as preservative. Soy sauce, (water, wheat, soy bean, salt), water fruit juices, pineapple, lemon, chili powder, garlic, hot peppers, ribotide, sodium benzoate. 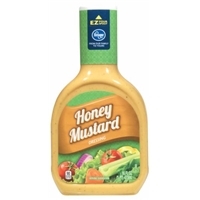 Water, soybean oil, honey, dijon mustard (water, mustard seed, vinegar, salt, white wine, citric acid, tartaric acid, spices), sugar, distilled vinegar, white wine vinegar, contains 2% or less of egg yolk, modified corn starch, salt, spice, xanthan gum, beta carotene (for color), potassium sorbate and sodium benzoate (preservatives), caramel color, oleoresin paprika (for color), calcium disodium edta (to protect flavor). 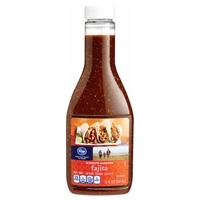 Water, high fructose corn syrup, red wine vinegar, soybean oil, distilled vinegar, contains 2% or less of salt, red raspberry juice concentrate, xanthan gum, dried onion, natural flavor, poppy seeds, potassium sorbate and sodium benzoate (preservatives), spice, calcium disodium edta (to protect flavor). 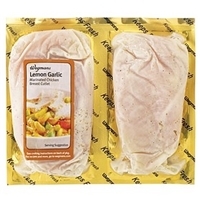 INGREDIENTS: WATER, LIME JUICE FROM CONCENTRATE, HIGH FRUCTOSE CORN SYRUP, DISTILLED VINEGAR, SOY SAUCE (WATER, SOYBEANS, WHEAT AND SALT), SALT, DRIED GARLIC, OLIVE OIL, DRIED ONION, APPLE CIDER VINEGAR, CONTAINS 2% OR LESS OF THE FOLLOWING: SPICES, SOYBEAN OIL, XANTHAN GUM, SODIUM BENZOATE AND POTASSIUM SORBATE (PRESERVATIVES), CALCIUM DISODIUM EDTA (TO PROTECT FLAVOR), CITRIC ACID, NATURAL FLAVOR. 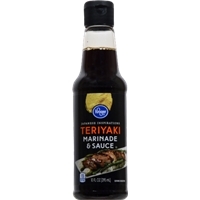 Naturally brewed soy sauce (water, wheat, soybeans, salt), water, wine, sugar, salt, vinegar, natural flavor, sodium benzoate (preservative), xanthan gum.contains wheat and soy.